The goal is to collect boxes using the touchscreen to control the avoider, while avoiding the red smileys that move around the map to avoid death. You have to collect the 100 boxes that appear one at a time on screen using the avoider. Each time a box is hit with the avoider a new box will be revealed at a different place on the field. With every box picked however,a red smiley will materialize as well. These move across the screen in various speeds and directions. Every box collected gives 1 to 5 points, depending on the time taken to pick it and increase the red smiley speed. Apart from getting less points when being slow, the avoider will also slowly grow bigger if it doesn't pick a box. It regains its original small size after picking up a box. Every 15 boxes a green smiley will appear from the left hand side of the screen. When the avoider touches it, it goes into 'rage', meaning it will temporarily change into a big evil avoider that can eat the red ones, who now are the grey ones. 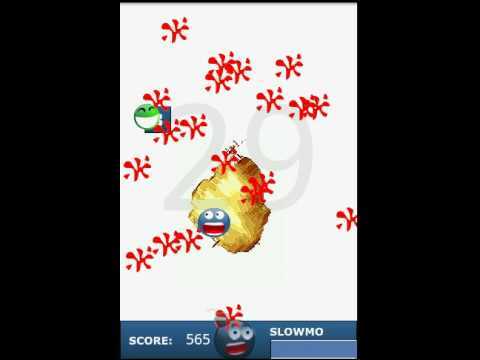 The rage lasts for about 3,5 seconds, with every red smiley eaten counting as a point, which makes the game easier after the rage. If you kill more then 15 smileys in a row, you gain the difference between the kills and 15 as bonus points for each pointbox. It will be shown next to the box. If you collect the boxes very fast, you will gain +2 bonuspoints up to +8. One important feature is the 'slowmo'. With every eaten pointbox a bar fills to a maximum of 10 seconds. You can activate it anytime by making an doubletab everywhere on the screen. The red smileys will move very slowly, allowing the avoider to maneuver easily. The last feature is the bomb. You have one at start and about ~ 50 eaten point boxes it will appear an new bomb falling down the screen. You can only have one bomb at time. You activate it by making a doubletab on the bomb icon. Is has the affect, that all smileys die instantly.